Plum & Spilt Milk Special Chocolate Week Menu – Get it in Your Belly! I am a bit of a picky eater. I think that with all my allergies it is probably understandable and as such I often don’t eat out. That and the fact I commute 3.5h a day which kinds of makes a meal out less a treat than a mission. So when I was kindly invited to preview the Plum & Spilt Milk menu for Chocolate Week I decided to struggle on my crutches to Kings Cross and see what it was all about. I was greeted with a lovely chocolate cocktail and the PR folk plus Fred who develops all the flavours for Gu and I am sure keeps pushing the boundaries of creating an excellent product for a large commercial company. I can’t imagine the challenges Gu faces to keep the product of a high quality and affordable as well as transportable. I imagine those glass ramekins are a challenge too (I have 20). However getting to help with a Chocolate Week menu at a restaurant which boasts itself to be at the level of the Ritz (according to the PR) was intriguing. The PR for the restaurant reassured me that they would not normally serve Gu desserts as they make everything from scratch in the kitchen. As a mass market dessert, its inclusion was a special accommodation due to the relationship of someone and someone else, as these things usually go. She made sure I was clear that this was an exception, not the rule and so I pass her message on to you, my dear readers – go now because this is a rare occurance. The experience, like any press dinner, may or may not be reflective of the service you may receive on the night. 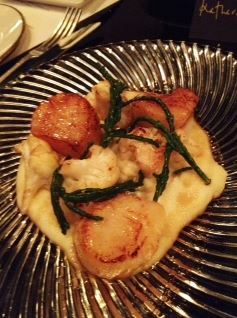 As a restaurant that positions itself at the upper end of the market, with Michelin-starred Mark Sargeant at the helm in the kitchen, it may very well be as excellent an experience as I had. 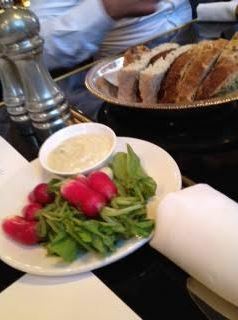 The start of the meal always begins with bread and nibbles and here there was a breadth of delights to try. From freshly made bread to interesting dips, before we even got our starter we had a feast. I called and checked and sadly that was a special for us press type folk but you’ll get freshly made bread and spreads to start your meal. The menu is fixed but as someone allergic to shellfish I was given a great salmon starter instead of the scallops so please don’t avoid booking because of that! The scallops did look great if you’re into that. Interestingly Mark, who joined us for dinner, also got salmon. Apparently he’s had his lifetime fill of scallops. Next course was venison. 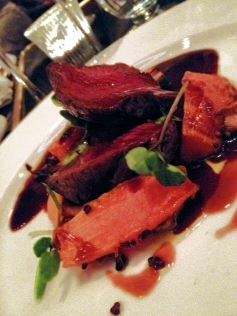 Now, as a Canadian who has eaten a fair bit of deer in her day made in a variety of different ways, I am picky about my venison. Using crutches means I can’t grip properly to so I was darn lucky the venison was perfectly cooked, requiring only a little cutting to separate it from the piece of meat. The chocolate component was the sauce and cocoa nibs in the squash. Unlike the offering from Gaucho which was at times questionably combined, this was perfectly complimentary. Chocolate as a savoury ingredient here absolutely complimented and you didn’t feel like you were eating something with cocoa – it was just delicious. 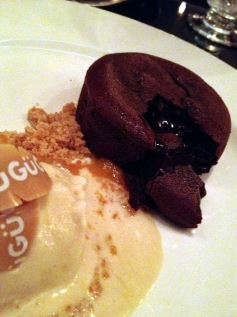 The dessert was a melting middle Gu pud with tonka bean. This makes the chocolate more floral and some people love that. Isn’t my favourite flavour but it is delightful. The caramelised white chocolate is a new trend that is catching on and that plus salted caramel makes for an awesome dinner feast. 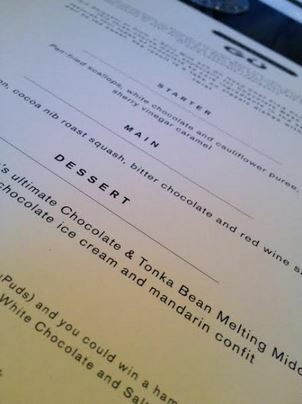 This dinner is available for all of Chocolate Week and when I called they still had reservation space available. If you’d like a relaxed fine dining experience during Chocolate Week with quality food you can get this menu for £48/person. Add to that a nice 2010 wine (it was a good year in many areas of Bordeaux but for some areas 2009 was better) and you’re away! To make a reservation at Plum + Spilt Milk for their National Chocolate Week menu with Gü, please contact 0203 338 0818 or email reservations@plumandspiltmilk.com. 4 Responses to Plum & Spilt Milk Special Chocolate Week Menu – Get it in Your Belly! I still have happy memories of a dinner that Fred cooked for me at the then-head-of-marketing for Gu, in her home kitchen. Was such a lot of fun and delicious too. I’m a big fan of Gu, as my local supermarket had them in early, I think they may have been a pilot store. I’ve not tried the new ones I’ve seen on twitter though, need to get some of those next time I go in. He’s had his lifetime’s fill of scallops?! Is that even possible?? 😉 Sounds like a wonderful menu and a great experience!